Relax, exhale, and breathe new life into your skin with Oxy-Mist by bio2 Cosmeceuticals International. EsthetixMD Spa & Laser Center is happy to introduce this spray-on therapy to our Bend-area patients. In studies, patients bounced back to regular activities in 3 to 7 days after aggressive CO2 and Erbium laser resurfacing, which usually requires up to two weeks of healing. In fact, patients wore make-up just days after treatment! Oxy-Mist users’ skin was tighter, smoother, and firmer skin than those patients using “standard” regimens, like Vaseline with water and vinegar soaks. You don’t need cosmetic treatment to reap the benefits of this skin-repairer! Oxy-Mist is also suitable for patients suffering from rosacea, and diabetic and pressure ulcers, among other conditions. Are you ready to benefit from all Oxy-Mist has to offer? Call our office at 541-303-9155 to discover the ease of Oxy-Mist, alone or as a complement to the many procedures at EsthetixMD. Spray away post-treatment discomfort and redness, and optimize the beautiful results of laser resurfacing and other cosmetic procedures with Oxy-Mist! 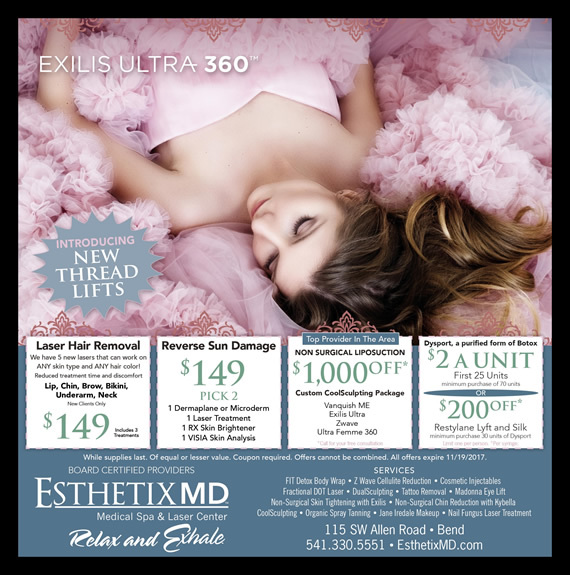 EsthetixMD is pleased to introduce this powerful mix of skin-repairing ingredients and medical-grade oxygen to support a healthy, speedy recovery and youthful skin. How can Oxy-Mist help you? Call 541-303-9155. Skin deep specials: Check Out Our Specials!